Hope you've been snuggled in and sleeping well! 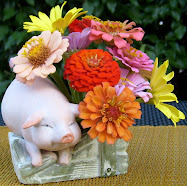 Thanks to Bloggy Buddy Donna for sharing a link to this cute pic! everywhere. It was grown but he and the beagle slept like that- right against each other. thanks for the chuckle to get my morning started off right. Oh my goodness, that is adorable! A perfect picture for Earl's room! Oh... SUCH a very sweet photo that is. Just love it! Aw that is cute! I slept very well last night! The cooler temps make me very happy! O-h... 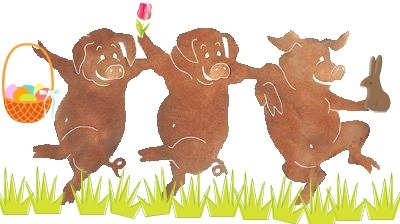 m-y...g-o-o-d-n-e-s-s...I could just dive right in with these cute little puppy's and the most adorable piggy...that is just toooooo cute,I love puppy's and piggy's. It was chilly here last night too. We went for a walk and had to pump it a little to stay warm. I saw your BLT dip! I could eat dips night and day. That one looks great and I am pinning it. If I make it just for the two of us, I will eat it all by myself. I need to serve it on Sundays when we get some help "pigging out"! what a cute photo. They all look like little angels. 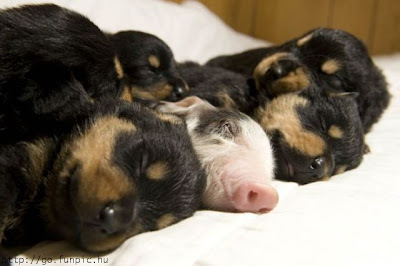 There is a baby pig in that mix-adorable! Cheers to have some cooler air in the evening. Would love some here. Hi Lynn, It is cooler in the mountains and we are loving the change. Awe that is so cute. They're so adorable! I love puppies. Thanks for these photos. I love it. God bless you. this has got to be the sweetest photo of all times. OH YES! That would have to hang over "Earls Bed"!!! I LOVE cool nights and ours are getting quite CUDDLY...There is nothing like a warm blankie and good companionship!! !